The Fagbug during a visit to Durham, North Carolina. Brightly painted with rainbow colors striping it from front hood to rear fender, the Fagbug is coming to Wright State University. 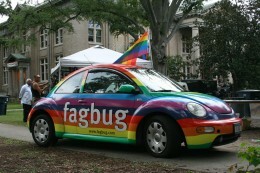 The Fagbug is a Volkswagen New Beetle owned by filmmaker and gay rights advocate Erin Davies. After her car was spray-painted with gay slurs in 2007, Davies embarked on a cross-country trip to raise awareness about hate crimes, homophobia and bullying. Davies shot her documentary Fagbug during that trip by collecting the reactions of people on video as she told them about what had happened to her. “We hope that Wright State students will be inspired by Erin Davies and her film to create change, stand up against discrimination and learn to value diversity,” said Susan Vance, graduate assistant with Gay, Lesbian, Bisexual, Transgender, Questioning and Ally (GLBTQA) Initiatives. Davies traveled 55,000 miles through 41 states and interviewed 500 people for the film. Volkswagen Group of America and the Sundance Film Festival sponsored Davies during the trip. Fagbug premiered at film festivals across the nation in 2009. Wright State students will get the chance to see the Fagbug, meet Davies and watch her documentary Thursday, Nov. 15. The Fagbug will be parked outside the Student Union after lunch. The reception, movie screening and Q&A with Davies will take place from 5:30 to 9 p.m. in Room 120 of the Medical Sciences Building. This event is sponsored by the Wright State Rainbow Alliance, Allies: Organization for Gay, Lesbian, Bisexual, Transgender, Questioning and Ally (GLBTQA) Faculty & Staff, and the Office of the President. Visit fagbug.com to learn more about the car, the movie and Davies.